The morning’s activity was over. Bob Baffert had fielded his usual share of questions about his powerful Kentucky Derby one-two punch, American Pharoah and Dortmund. And he did so with his usual diplomacy, deftly avoiding those queries that addressed the merits of one colt versus the other. These, after all, were young 3-year-olds, whose path in life was just being formed. We had no idea what lay ahead for them. All we had was hope that one or both would go on to become something special. We had marveled over Dortmund’s gargantuan stride and his speed and athleticism for such a big horse. And we were captivated by the amazing power, grace, and fluidity of American Pharoah’s stride, which bordered on perfection. American Pharoah’s overall profile was the antithesis of everything I’ve always believed a Kentucky Derby favorite's should be. He was a committed frontrunner who had not proven he could win any other way, and he had never been tested in battle, so we had no idea how much fight he had in him. His pedigree, even with several strong points, had enough question marks to make one wonder if he could carry his speed a mile and a quarter. And his career had been halted by a fairly serious injury, which prevented him from running in the Breeders’ Cup Juvenile. So why did I have him ranked No. 1 over Dortmund and the other leading 3-year-olds, even after Dortmund demolished his field in the Santa Anita Derby to remain undefeated in six career starts, while American Pharoah had only an easy front-running victory in the slop in the Rebel Stakes in the past six months? The answer was simple. American Pharoah had an aura of greatness around him, based on stride and a rare professionalism, and was the most mechanically perfect racehorse I had seen since Spectacular Bid. 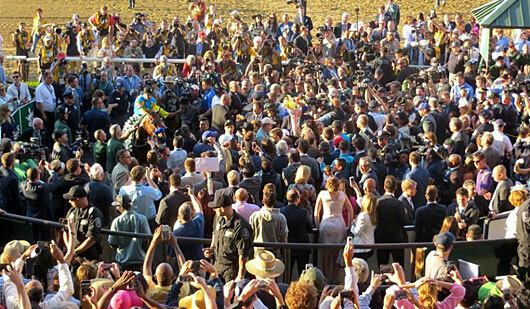 When I arrived at Churchill Downs, I had never seen American Pharoah close up and never felt that aura generated from the positive energy he emitted. 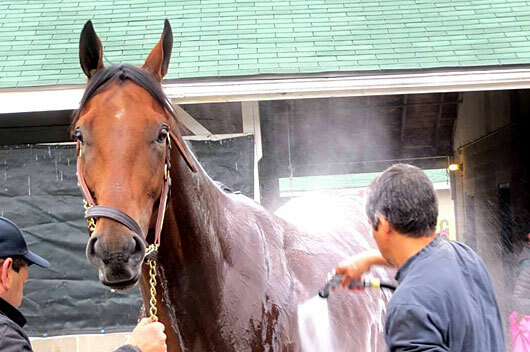 That ended the first morning he went to the track and was back at the barn getting his bath. As I stood with my little Canon Sure Shot aimed and ready, Anerican Pharoah turned his head and looked right at me…or I should say through me. The last time a horse had that effect just looking at me was Secretariat as he was being saddled before the Preakness. It’s hard to describe. It is a look that just strips away any hardened exteriors you might put up, whether intentional or not, and forms some kind of emotional bond. It’s just something that cannot be described in even a semi-intelligent manner. It is something that is felt, as if establishing some kind of connection. Some call it the look of eagles. What I did see were a pair of piercing eyes that were set far apart on the colt’s head, suggesting a vastly intelligent horse with a huge cranial cavity. 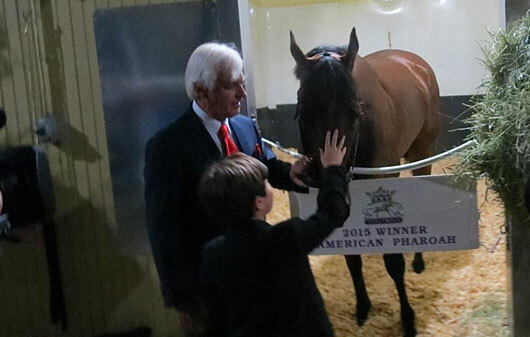 So, that was my first true encounter with American Pharoah, but it would not be my most profound. The media had long departed on this particular warm, sunny morning, and Baffert’s barn was once again quiet. At the opposite end from Baffert’s office, assistant trainer Jimmy Barnes was walking American Pharoah and led him outside the barn. It was unusual seeing a Baffert Derby horse being led out that end of the barn in the middle of his walk. 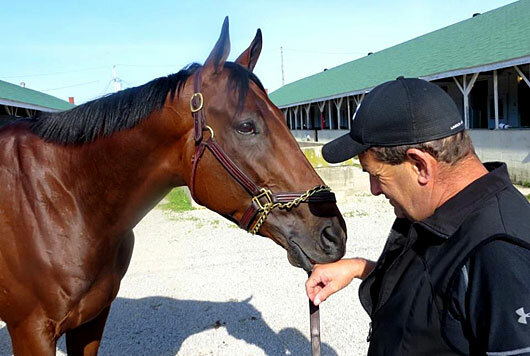 He had already has his bath, all the horses were back in their barns for the morning, and Baffert never grazes his horses, so he wouldn’t be walking to pick on grass near Longfield Avenue. There was nothing outside that end of the barn other than a recently cleaned manure pit. I had no idea what Barnes was doing and what his intentions were. “Why are you bringing him out here?” I asked. 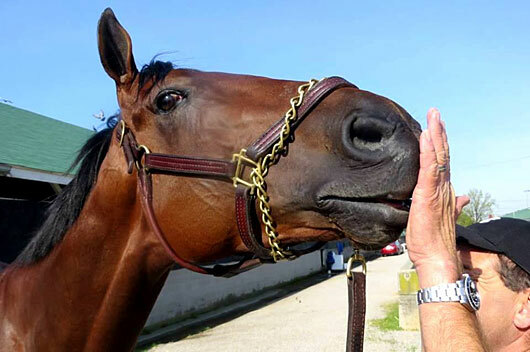 So, it was just me, American Pharoah, and Barnes with not another soul around in as intimate a moment as I could ever recall with a Derby favorite. One person did pass by, but had no idea who this unassuming-looking horse was standing outside the barn and quickly left. 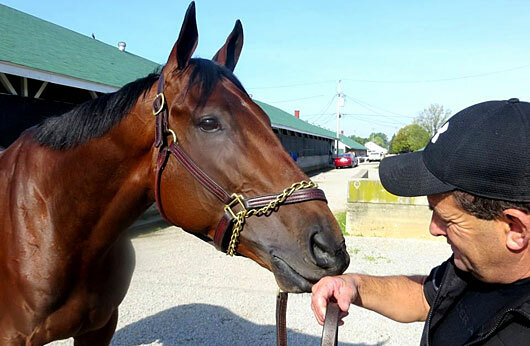 It was during this time that I truly became close to American Pharoah and witnessed firsthand his extraordinary personality; a personality that would become legendary. You could see the relationship already that Barnes had built with the colt, as he continuously played with his mouth and let him nibble at his fingers. Pharoah’s ears kept flip-flopping in all directions and it was apparent he was enjoying the interplay and the jollity of this lighthearted moment in the sun. The package was complete. 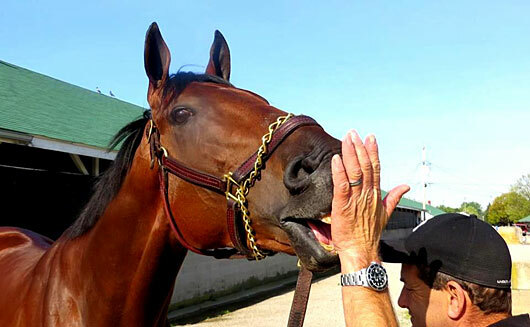 I was now in love with all aspects of American Pharoah. 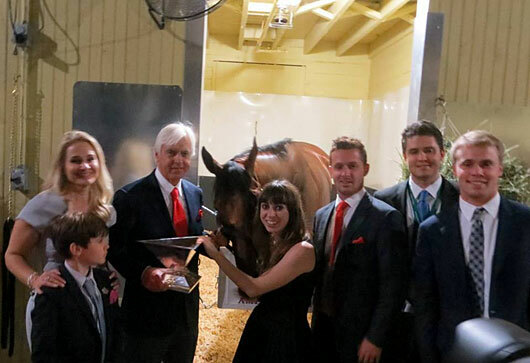 I can’t help but think back to that moment, in light of the global phenomenon American Pharoah was to become. The millions of hearts he would touch; the unrestrained euphoria he would inspire; his breathtaking, historic performances; his ability to lure people from all over the world to see him run; his kindness and gentleness in welcoming all visitors, whether one or 50…celebrities or common folk; 14 cross-country plane trips logging 28,000 miles. In short, he was unlike any horse in memory. He truly was the people’s horse. A horse created for a magical, but arduous, journey just such as this. 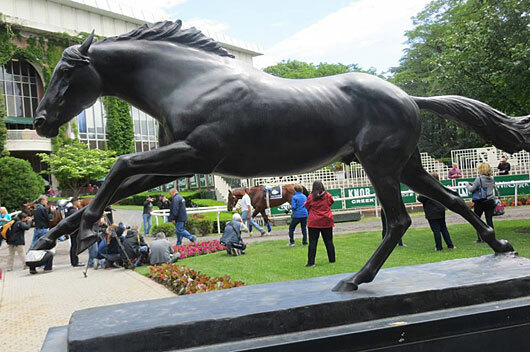 I think of that early quiet encounter with this icon who would transcend racing and sport in general and make international celebrities out of his owner, trainer, and jockey. I think of stroking his neck for the first time and that first look into his eyes. If only I could have foreseen what was to come. That this gentle soul, this plain brown horse enjoying something as simple as a morning in the Kentucky sun would one day make the earth move.